Today we’re chatting with a good friend of mine who has helped me a number of times when preparing for Ninja competitions… He’s a honest-to-goodness American Ninja Warrior, welcome Travis McClure! Thanks so much for your time Travis! I know it’s a pretty open-ended question, but how was competing on American Ninja Warrior? 10/10 Would Ninja again? Competing on American Ninja Warrior is an intense mix of emotions that build and build as the night goes on. You experience pretty much every emotion possible, you’re in awe at the course, you watch in amazement as the testers show you what they expect you to do, which also fills you with a little bit of fear, nevertheless the anticipation builds as it gets closer for you to actually run, while you admire the ninjas who go before you. When you’re actually on the course you’re filled with pure joy as you strain all your muscles, you don’t even notice how hard you’re pushing them because you’re just so excited to doing what you’ve been looking forward to all year. When fall, you’re annoyed and enraged, but those feelings quickly disappear by the time you pop back up out of the water when you realize how amazing the whole experience was. It’s a real roller coaster, but honestly, it’s the most fun you’ll ever have. As for the second question, definitely a 10/10 I’ll do it as many times as they’ll let me! I’ve applied 5 times and got to compete twice (before this season), and they were both amazing experiences! 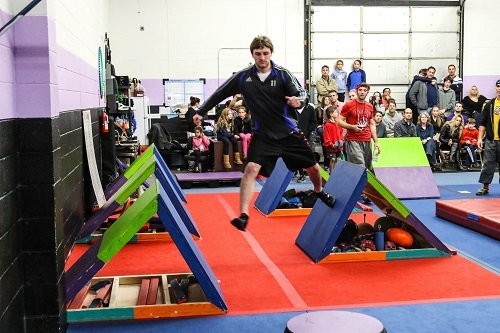 Are you still training for future seasons of American Ninja Warrior? I’m always training for next season. Admittedly, I haven’t gotten to train as much as I would like lately, as I just started a new job at the same time I’ve been reworking and upgrading ANWFantasy.com. But yea I’m always trying to get better at obstacles, and be ready for the next season. I was actually watching season 2 of American Ninja Warrior today, and the Brett Steffensons, Travis Rosens and David Campbells were great even back then… how do you get into the right head space knowing that there are absolutely incredible ninjas out there? 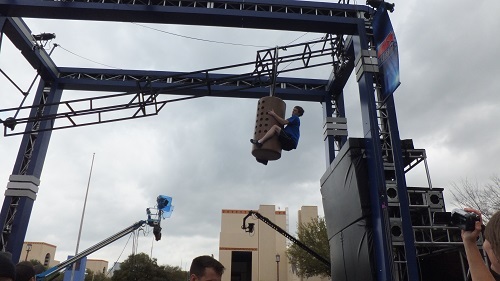 That’s easy, in American Ninja Warrior you’re never competing against other ninjas, you’re just competing against the course (sure there are rewards for the fastest times and in the city rounds only the “furthest the fastest” advance, but if someone goes further faster than you then they deserve it). So it doesn’t matter how the perennial studs do, you just go out there and do the best that you can. Everyone cheers on everyone its one of the coolest things about the other competitors. I also think everyone has their own definition of what success is on American Ninja Warrior. Sure, for the top guys its total victory, but I know where I fall (no pun intended) compared to them, and think making it to the Las Vegas Finals would be a win for me. Besides, who knows what might happen once I’m actually on the finals course. I know it’s probably not okay to ask…. but do you have a favourite ninja? Hahaha, that is a rough one! So I used to live about an hour from GCA Parkour, and I would train there every week with some of the biggest names on the east coast: Drew Drechsel, James McGrath, and Joe Moravsky (to totally name drop). I’ve also been doing this a long time (I first competed in Season 4), so in all that time I’ve met most of the top ninjas and they’re all super cool people. But, this is a question on the application form every year, and my answer has not changed since Season 4. My favourite ninja is Levi Meeuwenberg. 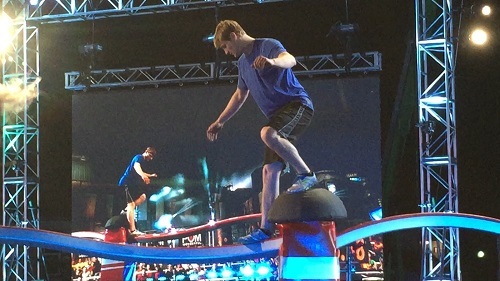 I know he hasn’t competed for years but it is because Levi did so well when G4 (the channel that brought Sasuke to the U.S) created the American Ninja Challenge and sent a few lucky winners to Japan to compete alongside the Japanese Ninja Warriors that we even get to have American Ninja Warrior. So, unquestionable my favourite ninja is the one who paved the way for the rest of us, Levi Meeuwenberg. Oh, and he’s also from the same state as me, so that’s pretty awesome too! I’m not sure if anyone knows this, but I have two twitter accounts… one to follow all the Ninjas, and one to follow AFL Dreamteam and Supercoach… fantasy sports and American Ninja Warrior are seriously two of my favourite things… and you, being a total ledge have combined them. Tell us about www.anwfantasy.com? Hahaha, nice that’s a cool way to organize your twitter facts! Yea so, ANWFantasy.com is exactly what it sounds like, it is a fantasy game to play along with American Ninja Warrior (ANW). You pick a team of the 5 ninjas you think will go the furthest the fastest next season and earn points for the obstacles and courses they complete (there is also a bonus 0.5 for the ninja who clears each course the fastest). Scores are then added together and the fantasy owner with the most combined points at the end of the season is the winner. This year (like last year) there is also a $250 prize to fantasy owner who picks the overall best fantasy team! Everyone’s teams are submitted into one massive player pool so you can compare your fantasy team to anyone else who has made one. It’s kind of like those March Madness Bracket challenges, except instead of Warren Buffett offering a billion dollars for a perfect bracket you get $250 if you make a team better than everyone else lol! For far too long the question bounced around the ANW community of who are your favourite ninjas or who do you think will do better next season. So, I decided to make a way for people to put their picks to the test against others. Also, I’m a huge numbers nerd when it comes to my fantasy projections and sports in general. I love hearing things like: “LeBron James has just passed Michael Jordan for the most 25/5/5 games in NBA playoff history” (a stat I heard back in May of 2014 that drove me to sit down and try and create something similar for American Ninja Warrior). So also on ANWFantasy.com I have all sorts of custom stats that give super fans even more ways to debate the greatest of their favourite ninjas. $250USD?!? That’s like $77,000 Australian! When do we need to get our entries in by? March 7th. March 7th is the official filming date for the Los Angeles City Qualifier for Season 9 of American Ninja Warrior. All entries must be submitted before filming begins. If someone sees who does well in the LA they already have an advantage over everyone else and that’s not fair. We will be accepting teams all the way up until the Las Vegas Finals are filmed (which is a date that hasn’t even been announced yet). However, if you want your chance to win $250 you gotta make your team before March 7th just so things are fair. I like to make it harder on myself by wanting to select the next breakout 2nd year rookie, Daniel Gil was a super easy pick last year, he looked like he’d be training for this his whole life.. which 1st or 2nd year rooks do you like the look of for this year? Nice that’s a fun twist! Well I think this year’s sophomore sensation is an easy one much like Gil last year. For me, no question it’s Josh Levin, dude is an absolute beast, while also being insanely calm and collected on a course. I mean, he is the most decorated youth climber in American Climbing history, so performing on the big stage is nothing to him. As for rookies, I haven’t really heard of any kids that just turned 21 (there were rumblings of how good Josh Levin was gunna be even before he competed last year). However, with the way the sport is growing here there are ninja gyms everywhere! This very well could be a huge year for rookies! Thanks so much Travis!! For sharing your experiences and seriously for creating ANWFantasy.com My partner and I watch every episode of everything Ninja Warrior, I’m going to get to her to make a team so we can get a little wager going. Thanks dude!! Awesome! And again, thanks so much for doing this Adam, I’m just glad people are enjoying the ANWFantasy.com! ANWFantasy’s facebook page is actually seriously great… Travis writes up articles about the individual ninjas (or ninja killer obstacles) with all the stats behind it. I seriously love this idea so hard, I’ve been playing AFL Fantasy for well over a decade so I literally can’t wait to see how my ANWFantasy team goes… watch out world SuperHeroMegaTeam is coming for you! ← Victoria’s first Ninja Event! → Ninjas In Training : Cristin!